Vibration testing on the James Webb Space Telescope, the multibillion-dollar successor to Hubble, has resumed after engineers traced a problem that cropped up last month to a restraint holding part of the observatory’s giant segmented mirror in place for launch. The quick diagnosis keeps JWST on track for launch in October 2018, and engineers still have several months of time reserved in the schedule leading up to launch late next year to handle any more unexpected problems. 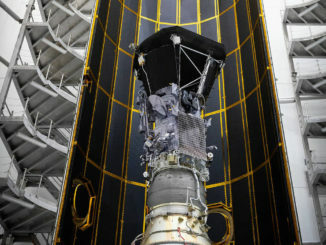 In a status report posted to the JWST web site this week, NASA said numerous tests and analysis of data and modeling led engineers to attribute an anomaly during vibration testing Dec. 3 to “gapping,” or extremely small motions, in a launch restraint mechanism holding back the wings of the telescope’s primary mirror, which are folded and stowed to fit inside the rocket for liftoff, then unfurl once the observatory is in space. Eric Smith, JWST’s program director at NASA Headquarters, said in an interview last month that accelerometers near the launch restraint mechanisms detected unexpected readings during vibration testing intended to ensure the telescope and its instruments can survive the shaking of launch. 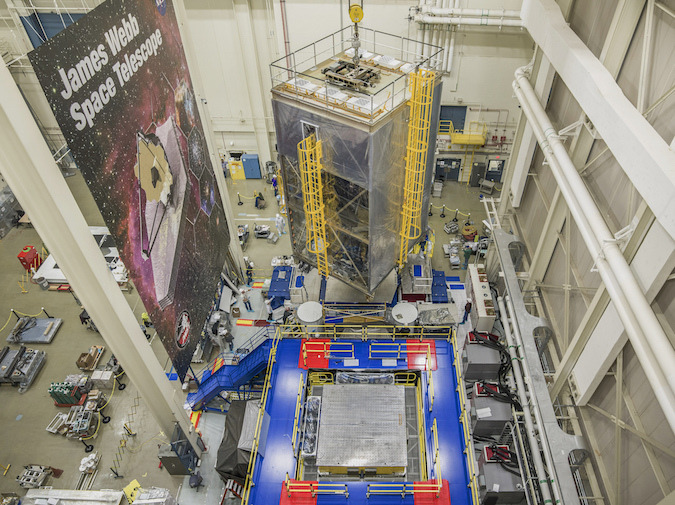 The vibration testing, which has now resumed, is being done on a special shaker table inside a clean room at NASA’s Goddard Space Flight Center in Greenbelt, Maryland. The testing includes the telescope’s primary mirror, made of 18 gold-coated beryllium segments, the optical support structure, and JWST’s science instrument bay. 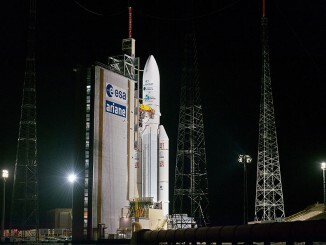 NASA officials are working with Arianespace, which will launch JWST toward the L2 Lagrange point a million miles (1.5 million kilometers) from Earth on a European Ariane 5 rocket, to “ensure that the vibration testing program will adequately test the Webb payload with the expected launch vibration environment,” the agency said in an update posted on the mission’s website. The launcher is a major contribution to the JWST program by the European Space Agency, which also led the build of two of the observatory’s four main science instruments. JWST is an infrared successor to NASA’s famed Hubble Space Telescope, promising previously unseen views of the proto-universe, the earliest galaxies and stars after the Big Bang, and data about the conditions on potentially habitable worlds orbiting other stars. “Everybody realizes this is very valuable space hardware, and you test like this because you don’t want to find this problem later,” Smith said. Ground teams at Goddard visually and ultrasonically inspected the telescope after the vibration test anomaly, finding no damage. According to Smith, actuators and restraints currently mounted on the telescope are ground test units, and were slated for replacement with flight-worthy versions before launch. Vibration testing recently resumed, NASA said, and shake checks on the telescope were completed in one of three axes over the weekend. The vibration test for the second axis was due to begin this week, officials said. Engineers are verifying the telescope and instrument structures can withstand the shaking of launch in all three axes of motion. The vibration test in each axis takes about a week or 10 days, Smith said, and will be followed by testing to subject the telescope to the acoustic environment of launch, which will take less than a week. Teams planned to run deployment tests on the telescope’s foldable wings before and after the vibration and acoustic tests at Goddard to make sure the critical deployment mechanisms are undamaged. Precision checks of the curvature of the mirror segments, each about the size of a coffee table, after the shake and sound tests will verify the telescope’s optics are still up to the job. Alignment checks are also planned. The telescope is buttoned up in launch configuration for the testing at Goddard. Its next stop will be NASA’s Johnson Space Center in Houston for a thermal vacuum test, which will expose the core of JWST to the extreme temperature it will encounter in space. “Once we finish the vibration and acoustic testing, there’s about a month or so of data analysis to make sure that everything tested out properly, and then it would ship down to JSC,” Smith said. The shipment to Houston could occur as soon as April. From there, the observatory’s science section will travel to a Northrop Grumman facility in Redondo Beach, California, for attachment to the spacecraft bus and sunshield, which will supply power, communications, pointing and thermal control to the telescope. 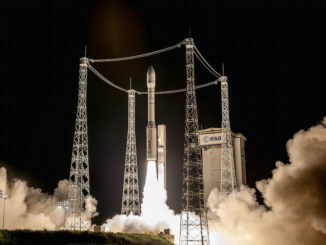 The spacecraft will travel from Southern California through the Panama Canal to the Ariane 5 launch base in Kourou, French Guiana, in mid-2018 for fueling and final launch preparations. Smith said the latest testing hiccup should have no impact on the October 2018 launch date. Managers had about six months of slack in the schedule leading up to October 2018 before the vibration test anomaly halted activities more than a month. 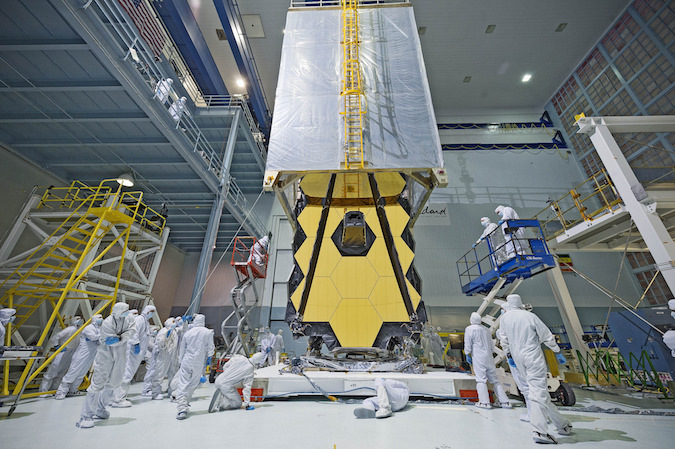 The vibration testing is in JWST’s “critical path,” meaning any delays eat into the program’s schedule reserve.